Another new friend I have made via my booth is Terri Young, a fused glass artist. 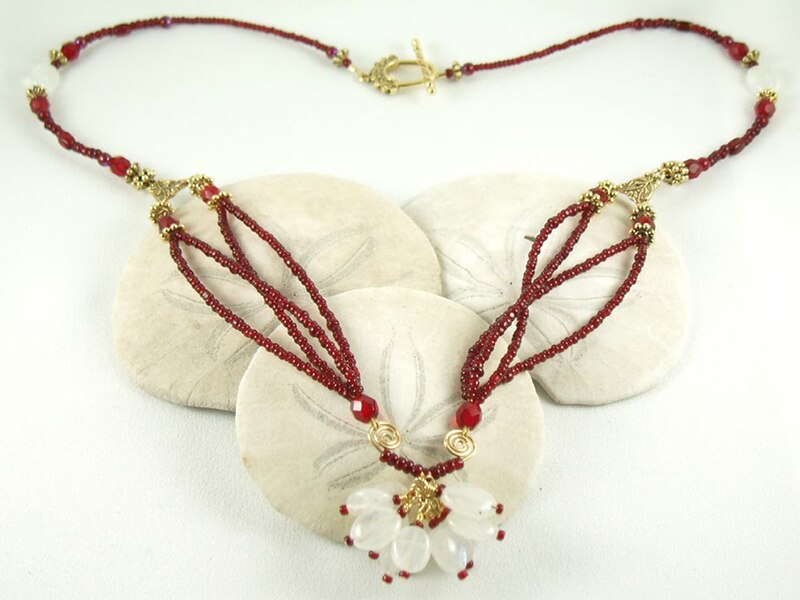 You can see more examples of her work on her website. All of her pieces are one-of-a-kind, hand-cut and kiln fired multiple times to achieve stunning results. She teaches classes too.....very tempting! A friend recently compared my Beadware tent to her office cubicle. She said my "cubicle" is bigger (10 x 10 feet) and I have an ever-changing view and cast of characters. Mukilteo July 17, 2010 - waterfront!!! Thanks to input from fellow etsy jewelry makers I have found a better magnet clasp! It looks the same as the ones I was using, actually a hair smaller, but boy are they stronger!! The brand is Mag-Lok. The tip I got was to be sure that the clasp has Mag-Lok imprinted on it. 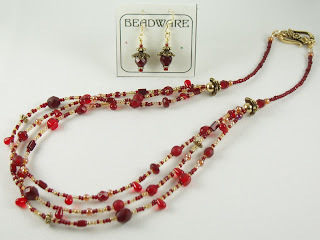 After researching prices I opted for a local internet bead retailer - Artbeads - in Gig Harbor. I ordered a few 6mm and 8mm to see if I liked them. The 8mm are too large for my tastes - and I could barely get them apart! Today I placed an order for more of the 6mm size in silver and gold plate. They are plain, but most of fancy ones I have seen are just not strong enough. Sometimes function is more important than looks! For my glass garden bracelets I will only use Mag-Lok magnets from now on. If you have one of my glass garden bracelets and have been unhappy with the strength of the magnet please contact me and I will replace them with these new stronger magnets free of charge. My online boutique will be closed until next Thursday. In the meantime you can browse thru the posts and pictures on my blog. Thanks for looking! Purple is one of my most popular colors, be it earrings, necklaces or bracelets. At a recent event a customer purchased some pretty purple earrings. Once home she decided a necklace to match them would be nice. She used my slide shows (to your right) and found her earrings and sent me a request for a necklace. 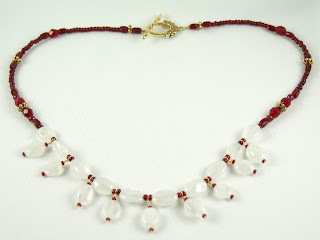 I used the same glass beads that were in her earrings to create this pretty necklace. This week I have been catching up on orders and special requests. 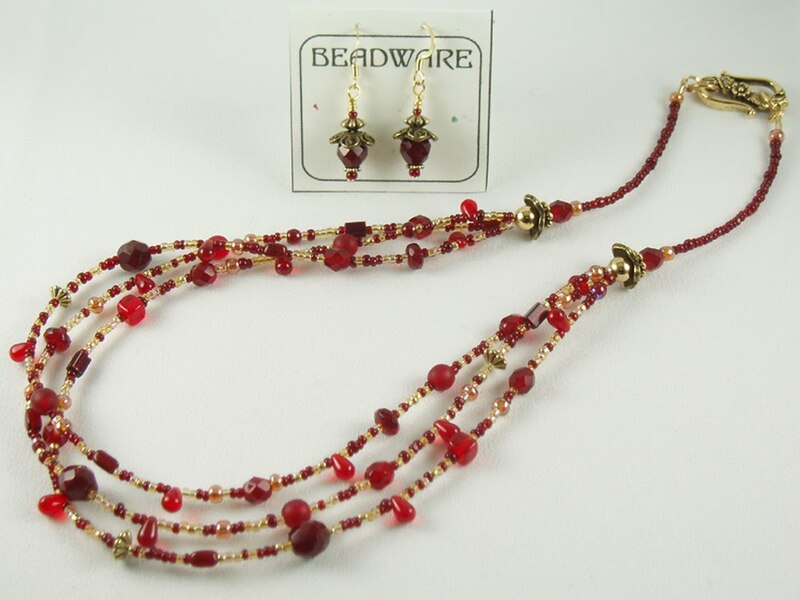 This is a made to order necklace and earrings. 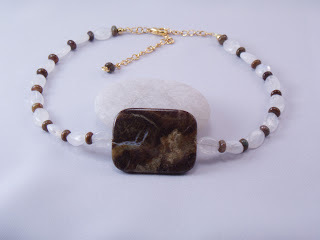 My customer gave me a description of what she wanted and selected the main beads. She wanted the necklace to fall to a certain spot so I had her stop in before I finished the ends so we could be sure it would land where she wanted it to. It is a mixture of black and clear Czech glass crystals and glass seed beads with sterling silver accents and a silver plated chain and clasp. A friend in MN sent me a package of forlorn looking parts. I restrung her bracelet for her and replaced the earwires on the earrings. She has been having a lot of trouble with metals so we are trying niobium ear wires. They come in fun colors. I changed out the earwires in these pearl earrings and then made a new pair just for fun to surprise her with. Both earrings have niobium ear wires. This is a chalcedony pendant hanging from assorted blue glass seed beads and a strand of black leather. The leather had worked its way out of the end. All fixed now! These are a friends daughter's earrings. I did not make these, but I said I'd try and fix them. One of them had come loose from its post. The solution was to remove both old posts and replace them with these cute stars. Then I re-attached the dangles. Ready to wear! My online boutique box to the right is empty because my shop will be closed all weekend while I am at the West Seattle Fest. Come on over and say hello! This week is occupied with getting ready for a big 3 day event - the West Seattle Fest. I am busy adding to my inventory. Some new things, but you will have to wait until later this month for pictures (if they do not sell that is!). Then next week is an art fair in Mukilteo. A busy beader am I! They set up a huge dance floor and stage right behind us. Hmm ..what is going on? SALSA!! At 6pm salsa lessons started, then the band took the stage and folks danced the evening away. A bit loud so we had to communicate with our customers via hand signals and smiles. But boy was it fun! And to top it off we sold quite a bit of jewelry! I've already put the first Thursday of August and September on my calendar. Salsa class. You can see Linda watching from the back of our booth (white tent in the background). Our view out our backdoor of the Latin band including horn and rhythm sections. Singers and dancers also joined the musicians onstage. Boy were they loud! !